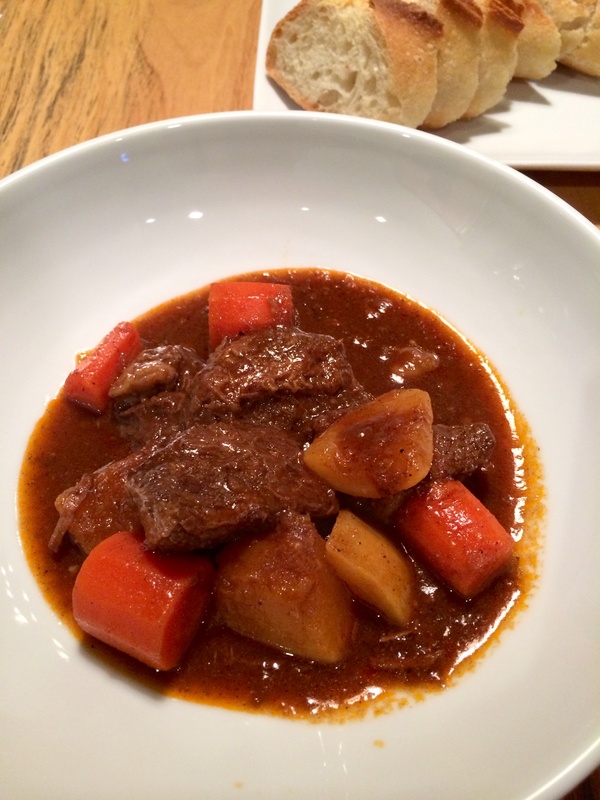 Winter inspires stews. This dish is one that I grew up with. An Asian beef stew with lemongrass, star anise, cinnamon and even a little curry for seasoning. Every Vietnamese family I know has their own version of it. Some like the sauce almost broth-like and served over rice noodles, garnished with cilantro, Thai basil and jalapeño slices. Others like it plain, with a side of baguette. Try the combination that suits your palate best. I prefer my sauce thicker and a little more intense. After it’s cooked, I let my stew sit overnight in the refrigerator. This allows the flavors to meld into the tender beef and veggies and for the fat to separate and harden. I discard the latter before I reheat it. I find that it the fat doesn’t really add anything and dilutes the flavor. I serve mine in a shallow bowl, with a few Thai basil leaves and french bread for dipping. Half a dozen years ago, a craving for Bo Kho struck me and I called my mom long distance to Vietnam for instructions. It was dictated to me in our traditional family way, with ingredients being approximated—a little of this, a dash of that— and, of course, I was told to taste and re-taste. Over the years, I dialed in the ingredients and proportions and kept notes of my changes and the result is the recipe below. Toast cinnamon and star anise. I do it directly on my flat top electric on high heat, very carefully, until darkened. It takes less than 2 minutes. You can also use a hot pan over high heat. Set aside when done. In large pot (I use a Dutch oven) over medium-high heat, add oil, shallots, garlic and lemongrass, cook for 1-2 minutes until shallots are transparent. Reserve one piece of lemongrass, you’ll use at the very end to freshen up the lemony flavor of the stew. Add beef to pot, season with salt, pepper and half of curry powder. Cook, stirring intermittently, until beef is browned. Add just enough broth to cover beef. Stir in ¾ of tomato paste and 3 Tbsp. of hoisin sauce. Add bay leaves, 1 star anise and 1 cinnamon stick (you’ll add the remaining anise and cinnamon at the end to give the flavor a pop). Bring to a boil, lower heat, cover and let simmer for 1 ½ hours. You can check flavor and re-season according to taste after the first 30 minutes. Sparingly add salt, pepper, hoisin sauce, honey (1 tsp at a time), vinegar (a dash at a time for acidity) tomato paste and curry powder as needed. If you’re re-seasoning throughout the simmering process, let flavors develop for 15 minutes before re-tasting. Check beef for tenderness. Beef should be close to desired tenderness before vegetables are added. If beef is not as tender as wanted, cover and simmer for an additional 15-30 minutes. Add carrots, turnips and additional broth if liquid does not cover veggies. Cover and cook for an additional 30 minutes or until vegetables tender. Let stew cool to room temperature and refrigerate overnight. About half an hour before serving, remove as much coagulate fat from the top of the stew as you can (or leave it – up to you). Add reserve cinnamon, star anise and lemongrass and bring to a low simmer over medium heat. Let simmer for at between 15-30 minutes to warm through and to steep the newly added spices. Remove the cinnamon and anise after a few minutes if you feel the flavors are getting too intense for your taste. Serve topped with basil and with fresh baguette slices. This entry was posted in Cooking and tagged anise, Beef, beef stew, bo kho, carrots, cinnamon, Cook, Cooking, homecooking, lemongrass, stew, turnips, vietnamese food on January 30, 2014 by friedchickenanonymous.